Counter-intuitively Power Yoga is not a hundred push-ups or repetitive cardio work. Neither is it hundreds of fast Sun Salutations. It isn’t a produce of the west and was in fact developed by Rishi Vaman somewhere between 500 and 1500 AD for the grihastha, the common householder – you and me. Power Yoga is a set of postures arranged in a specific sequence. It is as much about a controlled movement from one posture to another as it is maintaining each posture with strength. 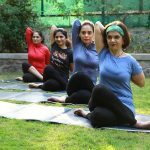 It is this transition and holding of postures with stability and awareness that makes Vinyasa or what we now know as Power yoga potentiate postures to produce heat. This flushes and burns physical and mental toxins. It was conceived for the grihastha or the householder. 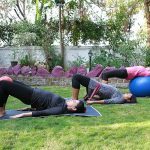 It is a complete exercise protocol – high intensity, intense Yoga which is stimulating & invigorating. Improves posture which is the root of our chair-bound lifestyle. Prevents degeneration of muscles and joints. Makes the practitioner look and feel good. Vinyasa focuses on activating Agni, that is, increasing metabolism. Tone & shapeliness is a natural by-product! Channelizes our hyperactive mind to bring focus and composure even under pressure. Retains the mental strength and flexibility needed to function efficiently. We offer Power Vinyasa Yoga with Pranayama and Pilates – P Cube! P cube is an optimised package we need in the present time!